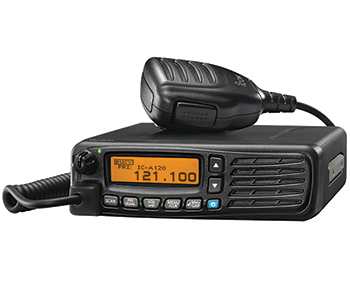 Icom’s IC-A120 Mobile Airband Transceiver is equipped with a crisp, clear, dot-matrix display; active noise cancellation (ANC) and automatic noise limiter (ANL*) technology; and straightforward programming and settings options that are accessible from the front panel. The IC-A120 meets IP54 standards for dust-protection and water-resistance and can be connected to an optional Bluetooth® unit for compatibility with third-party wireless Bluetooth® headsets. This IC-A120 variant has a vehicle mount included.